There are striking similarities between the race riots of the late 1960’s and recent riots, so does this mean the U.S. is headed for another race war? For many years after the late 1960’s race riots, there was still a sense of unrest and tension. I grew up in an African-American neighborhood and before the assassinations of Robert Kennedy, and the man of peace, Dr. Martin Luther King Jr., it all seemed well in our neighborhood. Some of my best friends were people of color, and growing up in this neighborhood, no one seemed to notice the color of a person’s skin. It wasn’t about race but about grace. We boys played in the wide meridian that stretched through our neighborhood. There was no animosity or anger between the different people of differing skin colors. We had never looked at our friends by what they looked like but who they were, and some of my best friends were not white children but black, red, and olive-colored, but we never regarded a person because of who they were, where they came from, or what they looked like. In fact, there were a few Jewish boys who had no trouble blending in at our school, but after the race riots tore the city in half, even my friends began to look at me differently, being white. Growing up poor, we lived in an area where almost everyone was a minority, but as children, we never saw them as minorities…but as friends, but everything changed in the late 60’s, and our lives and relationships would never again be the same. Suddenly, people began polarizing with the causes, and most associated the causes with color, but I still couldn’t grasp why some thought less of African-Americans, Hispanics, and Asians. The Apostle Paul spoke about there being a spirit of disobedience that is at work in those who are not saved. Paul would remind us that we too once walked in disobedience to God, because like me, “you were dead in the trespasses and sins in which you once walked, following the course of this world, following the prince of the power of the air, the spirit that is now at work in the sons of disobedience” (Eph 2:1-2), and is at work right now. For every sense of injustice today, whether real or imagined (many times, it’s imagined! ), there is an outcry and response that far exceeds the original cause. For example, when a white police officer has been cleared by legal means, if it involved a person that isn’t white, there is social outrage, and tragically, protesters take to the streets, and even worse, they break the law to a greater extent than the case that they are protesting for. What often follows is looting, violence, destruction and burning of private and public property, but these types of responses never make things right. In fact, it makes things worse and brings some cities to the verge of anarchy, where even the police are reluctant to go, however if we are honest with ourselves, we must admit that we too were like they were, and “once lived in the passions of our flesh, carrying out the desires of the body and the mind, and were by nature children of wrath, like the rest of mankind” (Eph 2:3). The Bible tells us that in the days leading up to Jesus return, it will be like the days of Noah when “The LORD saw that the wickedness of man was great in the earth, and that every intention of the thoughts of his heart was only evil continually” (Gen 6:5). What “every intention” being about “evil continually,” means is all they did was walk around, trying to come up with new ways to sin. Whatever they could imagine, they would do, so the world’s not that different today than it was in the days in which God sent His righteous judgment upon the earth with the flood, and again today, we could also say that “the earth was corrupt in God’s sight, and the earth was filled with violence. And God saw the earth, and behold, it was corrupt, for all flesh had corrupted their way on the earth” (Gen 6:11-12). Since we teach evolution in our public schools and that we descended from animals, how can we expect people to behave, however it’s not evolution that’s the problem, but the human heart (Jer 17:9). As I mentioned earlier, it’s not really a matter of social injustice that makes mankind react violently, it’s a heart issue, and the problem is, we need a new one. Ours is just as Jeremiah wrote, “The heart is more deceitful than all else. And is desperately sick; Who can understand it” (Jer 17:9)? That’s a rhetorical question…meaning, no one but God can understand the depths of our depravity. Jesus told us that it is “from within, out of the heart of man, come evil thoughts, sexual immorality, theft, murder, adultery” (Mark 7:21), and “Their feet run to evil, and they are swift to shed innocent blood; their thoughts are thoughts of iniquity; desolation and destruction are in their highways” (Isaiah 59:7). While these things are true about the world, we can’t feel superior because “such were some of you. But you were washed, you were sanctified, you were justified in the name of the Lord Jesus Christ and by the Spirit of our God” (1st Cor 6:11), but not only you; me too, however there is hope for those who trust in Christ. God had promised through Ezekiel the Prophet, that God “will give you a new heart, and a new spirit I will put within you. And I will remove the heart of stone from your flesh and give you a heart of flesh” (Ezk 36:26). Even though this was written to Israel, I believe it is true for us. I was deader than Lazarus’ 4-days-dead (Eph 2:1-5)! I needed a resurrection, and Christ did that through His redemptive work on the cross. I believe we may be headed toward another race riot, but I hope I am wrong. The rapid rise of white supremacists groups and the growing movements, like Black Lives Matter may be moving toward a head on collision. I pray I am wrong, but it surely looks like it. I’ve seen the signs before as a young boy of 16…and I am seeing them again. I managed to live through one city where they burned, looted, and turned to violence and it was white verses black. That’s what prompted our family to move to the small town in which I now live. To say it changed our lives is an understatement. Many of my childhood friends and their families, particularly those of color, turned against me and everyone that had my skin color, but the day is coming, in fact, has already come, when “There is neither Jew nor Greek, there is neither slave nor free, there is no male and female, for you are all one in Christ Jesus” (Gal 3:28). I could add that there is neither black nor white, rich or poor, Chinese or American, but all are one in Christ. What the world divides, Christ unites. 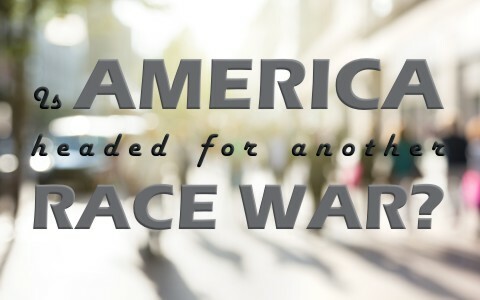 God did not make us as people who are white, black, red, or brown, but He “made from one man every nation of mankind to live on all the face of the earth, having determined allotted periods and the boundaries of their dwelling place” (Acts 17:2). Dividing our life by BC and AC (Before Christ and After Christ), we were of one man, Adam before Christ, but God has remade us by one Man, the God Man, after Jesus Christ, so my question to you is, “Have you put your trust in Him?” If not, why not!? Not all Christians are pacifists. Many believe in the right to defend ourselves. Bring it on. Prepared. Ready. Waiting. Fully armed. Hello Mr. Stephens. Let us pray that this doesn’t happen and that the nation repents and turns to Christ. All lives matter. Thank you sir. Just to clarify, I didn’t mean that the people participate actively in the Waco lynching. I meant participated as a viewer. It became a town spectacle so if any of the families in that town moved up north to Dallas, they may have interacted with my family in the past. This extremely contrived example is just my way of showing how near in the past horrific racial incidents could have been close to my family or potentially people you have interacted with in your lifetime. So painting an era before the Civil rights Movement with legal oppression as a great time for you, may be your truth, but it is a narrow view of an era not far removed from terrible racist incidents. I am in no way saying you or your family participated in Texas based racial incidents. Only stating there are tons of horrible racially motivated incidents that black Christians in the south dealt with during that time. Thank you Nick. Jesus came to save Gentiles and Jews, male or female, because human souls matter. God says they matter, not because of the skin color, but because Jesus came to die for them, so all lives matter to God and they should matter to us. Yes, whites have dominated but we cannot try to say black lives matter to the exclusion of everyone else. That is wrong. You speak of historical things. We need to focus on the present and learn from the past. Previous post: How Does the Birth of Christ Give Us Comfort and Joy to Live for Him? Next post: Why Are Christians Sometimes Unkind To Atheists?